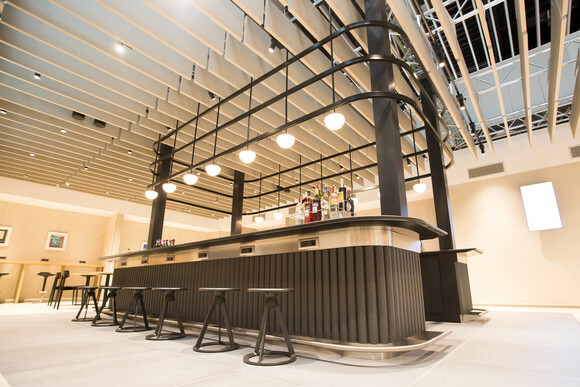 As part of its £4.5bn investment to benefit its customers, British Airways is set to revamp lounges across its network, starting with the opening of a brand-new lounge in Rome’s Fiumicino Airport. The lounge follows a new design concept for the airline featuring the very best of British and European design and delivering a luxurious and contemporary look and feel. Spread over 460 square metres, the space can comfortably host nearly 140 customers. It also features a number of zones that create separate spaces for customers to work or relax in ahead of their flight. The centrepiece of the lounge is a granite-topped feature bar, with bespoke lighting and comfortable low seating. During peak times the bar will be hosted by a mixologist enabling customers to sit back and relax as their drink is made to order. In quieter periods, the design of the bar allows customers to help themselves from the wide range of beverages on offer. The lounge also features high windows that allow natural light to flow in and provides fantastic views across the runway. The windows will feature smart electronic blinds that are programmed with sensors to react to light and heat throughout the day, ensuring that the lounge is always a comfortable environment for customers to relax in. Customers will also have access to power and USB points throughout the lounge to re-charge their personal electronic devices, as well as wireless printing.